This was written by admin. Posted on Saturday, October 31, 2015, at 2:16 pm. Filed under Uncategorized. Bookmark the permalink. Follow comments here with the RSS feed. Post a comment or leave a trackback. If the Mayor is so concerned with wasting money why is appealing the decision that will not change.Stop acting like a spoiled child and start becoming a Leader. I don’t think you are capable of that. One step to the right…two steps to the left…the Doherty shuffle at its best. Obviously doesn’t answer Ms. Sigmon’s request for clarification of Court ruling, and ends the dance a deceptive “we will use FEMA to rebuild the Taylor Pavilion” without mentioning the $3.9 million taxpayer obligation beyond FEMA’s allocation. My Republican friends keep sharing campaign mailings; No Means No, Former Mayor Pringle’s letter. I guess Independents DON’T MATTER, to them at least. I am voting NO, because I have been smelling a rat for three years now. That and because I can add and subtract, unlike the partisan sheep I share this community with ( hate ending with a preposition, but I’m fn mad). I am gladly and bravely ( unlike the mailers I just referenced ) endorsing David Schneck for Belmar Council. Again not because as an Independent, I would vote independent but because I truly believe has our best interest at heart. I have been burned ( and not slightly) by both the Dem and Republican candidates. They can take their mutual love fest to another town. To quote the 2015 DEms ” enough is enough”. Violating the Public Trust Doctrine and denying people’s civil rights as determined by the judge are not serious matters to Doherty. He clearly does not hold the people in high esteem. The Borough’s witness was found to be not credible. Seems to me that is pretty damning. #4 Public Trust Doctrine has to do with how land is used or accessed, I don’t think it is a criminal law. Denying civil rights is usually tied to a criminal act for it to be criminal. #4. 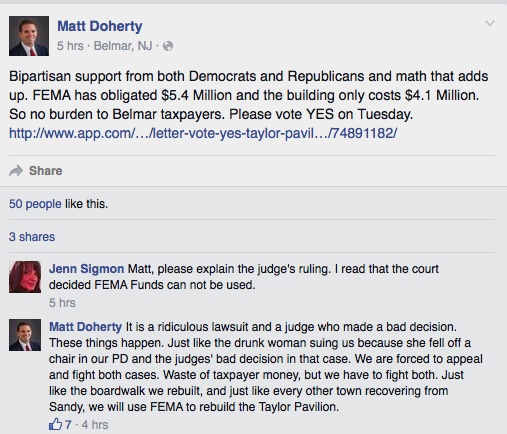 Not just our mayor… recently Councilman Thomas Brennan weighed in on a post to Matt Doherty’s Facebook as follows: ‘FEMA federal money, which we all pay into ( actually Tom many don’t pay any taxes ) beachgoers and taxpayers ( the correct thing to say since beachgoers are taxpayers, would be all taxpayers pay into ) It seems ( here is where a music major tries to trump the law and a judge with legal knowledge ) to me the Judge is trying to deny Belmar taxpayers ( a civil rights claim against her decision ) access to that federal money to the benefit of the beachgoer which is clearly unconstitutional.” Priceless Councilman. You got that there were federal tax payers who were plaintiffs some beachgoers and that the judge using the Law divided the amounts going to Belmar residents and to the beachgoers who many of paqy into the federal tax system that funds FEMA. But by protecting the civil rights of those who use our beach but don’t live here, her decision was “unconstitutional”? Please don’t quit your day job. #5 The matters I sited are not criminal, and I was implying that equating the Gummer decision with the drunk woman’s issue is not relevant, just deceptive. #6 Yes, Mr. Brennan should stick to the “do re mis” and looking smug and disdainful. And “not believing in wasting money.” He should educate himself before speaking about wasting money. And not taking the mayor at him word – and, and, and… Legal opinions from him? Fuhgedaboudit. Issues of Judge Gummer’s ruling revealed that Belmar’s residents were being hoodwinked about money they Will have to pay for CONSTRUCTIIN of 5th Avenue Pavilion. Very large sums of money that Will not be available from FEMA for the 5th Avenue Pavilion. Bundling money from other FEMA worksheets will not pass the smell test. End of story. The Flim flam, thank you Mam technique used in that FACEBOOK post is just that, FLIM FLAM. None of them said anything for days after the Judge’s decision and now a few days before the election they are legal experts. equal rights/civil rights. Under the Constitution, the Jersey Shore in in trust, we the people own it and Belmar is steward for we the people. Grau v Belmar stated that the mayors wish to make the beachfront an area of Belmar’s redevelopment was over-exercising its legal rights. The recent Susko v Belmar was decided that the people from where ever who had the right to the beach and ocean, regardless of Belmar’s stewardship in trust..could not take given by them to build something only to be used by a few. Dave can you update the number of hits on the blog tomorrow? Your last update of over 3,700 hits was amazing. With that many hits I don’t feel bad being blocked from the Democratic FB page.. people can get more exposure here. You’re comments are always welcome here Brian. I run the stats every Sunday morning but here’s a sneak preview. Today’s count is as of 5:00. My new favorite words: hoodwink and flim-flam. Just wish I could draw political satire cartoons. People, just ask your friends and neighbors to please vote NO. It really is that simple. Ignore the Doherty spin- just VOTE NO. Doherty knows absolutely nothing about the law Belmar will loose any appeal. They will not even file they just want the bond approved and will say the taxpayers must pay. #14. I am a cartoonist. Just ask. #11. A bit sophomoric, but not bad. To bad an elected official like Mr. Brennan has difficulty understanding “equal under the law”. Judge Gummer took into consideration that all are equal under the law. So Councilman Brennan pays federal taxes as a Belmar School teacher. According to his Financial Disclosure Statement as an elected official and filed with the State of NJ. He is the only member of his household to make an income. Merry Brennan has no income and when Tom plays gigs as a blues performer he makes no income. But with limited household income he pays federal taxes , a part of which ( minute) go to FEMA. He and Merry buy seasonal beach tags. Then there’s my friend Bill, Bill and his wife live in Lebanon, NJ. Bill is self employed in investments and makes high six figures. His wife works in real estate and brings in on a good year six figures. They pay more than the Brennan Family into federal taxes and accordingly, pay more for FEMA. Bill and his wife spend at least a week each summer in Belmar, they stay at the Saltwater Inn B & B and pay for daily beach access. Under the law they are both equal. Despite the income inequality, despite that Bill is black and Tom is white, they are equal under the law. Despite that Tom and Merry live near the beach and ocean but Bill and Sally live upland, they are equal under the law. Obviously This yes/no vote is quite the hot topic in town surrounding the pavilion. I managed to bump into some really good friends who I know are absolute democrats here in town. (I could not give two $hits to ones political party affiliation.) I asked of their view on the yes/no and NOT how they would vote. They all responded equally that this will not pass. Vote NO on Tuesday. Thank You Ken Pringle for informing the masses. Doesn’t take a rocket scientist to figure out how to vote. Ken Pringle, Belmar’s Most Valuable Person! Thanks for the kind words, but this has been a group effort from the beginning. #17 Our collaboration could be “interesting”. Let’s see how all this plays out. Thanks. We begged the Mayor repeatedly to stop the Pavilion full court press at numerous council meetings but, to no avail. With no choice avable we were forced to stop the reckless spending plans of the Mayor and I, for one, am proud of the decision that was made to reach out to the law firm of Pringle, Quinn and Anzaro, who ultimately on our behalf, saved Belmar taxpayers from financial ruin. Please read Ken Pringle’s Personal letter delivered by the USPS to all homes in Belmar. Sometimes the only thing we can do to protect natural resources and the environment is slow the pace of development …. Belmar reported record beach attendance in 2015 …. without pavilions ….. Also, the north end beach had a bumper crop of rare and endangered avian species …. all good indicators of the health of the beach that attracts visitors & residents. Please don’t kill the goose that laid the golden egg …. Sandy cleared the Belmar beach and provided opportunity for going forward smartly …. taking positive steps …. Not interested in the FEMA money grab …. if it only repeats the past …. Please VOTE NO! I trust a superior court judges understanding of our laws a heck of a lot better than our mayor and councilman. The arrogance alone is enough to get me crazy. Plus, notice they STILL have not acknowledged the ruling is DONE. It is final. When residents vote on spending 4.1 million on ONE building remember if you don’t find out till After that we ARE going to pay it isn’t because a small element of people haven’t been trying to get the word out. It’s because our Mayor and council are still trying to spin and manipulate. And when they reintroduce the stripping of pay to play don’t say we haven’t been trying to warn you. And if the bond passes and they lump all the bids together and hire a big Union house to do the extremely overpriced job, don’t say we didn’t try to warn you. Please VOTE NO!!!!! Matt talks about Bipartisan support but opposition to his spending is much broader including Democrats, Independents and Republicans. How much of our money is Matt wasting on all these lawsuits that clearly have little support in town? Ken Pringle keeps his statements professional and factual, wish I could say the same about the way Matt and Counsel operate. Thanks Mr Pringle for all your efforts protecting the family budgets of people who live here. The mayor’s statement is so ignorant it’s embarrassing. The Judge did not say we cannot use FEMA funds, just what we can use them on. It was not a terrible decision actually it was a will thought out, intelligent ruling that simply applied the law. Matt is a dope.